From an email by Obama’s Campaign Manager, David Plouffe: Barack Obama is about to make one of the most important decisions of this campaign — choosing a running mate. 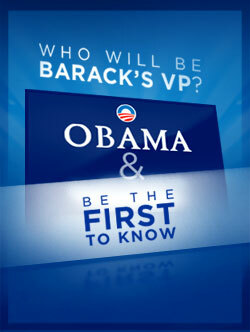 Want to be the first to know Barack Obama’s choice for VP? The Obama campaign is announcing Barack’s running mate to supporters via email and text messaging. Once you’ve signed up, please forward this to your friends, family, and coworkers to let them know about this special opportunity.